Unit testing is an important step in the software development process which makes sure that every unit of code in all layers of the application is tested successfully. Angular.js is a widely used client-side MVC framework in modern applications. Since this framework provides separating of client-side components using inbuilt dependency injection, it also brings with it support for testing every component e.g. Angular Controller, Angular Service etc. It’s always a good practice to test client-side components before deployment. In this article, we will unit test an Angular Controller. Here are some of the frameworks that can be used for testing AngularJS applications. Protractor - an end-to-end testing framework for Angular.js applications. This framework runs tests against the application running in a real browser. 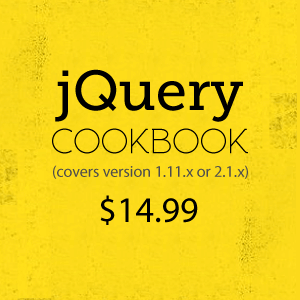 This is a Node.js program and uses Jasmine for its test syntax. More information about Protractor can be read from here and here . In this article, we will use Jasmine framework for testing our AngularJS controller. We will use the free community edition of Visual Studio 2015 although you can use any other free Editor like Sublime Text, Visual Studio Code etc. Prerequisites: You must already have Node.js installed on your system. Angular-mocks is an ngMock module. This module provides mocking for our tests. Mocking is primarily used in Unit testing to create objects that simulate the behavior of real objects. This module injects and mocks the angular service inside the unit tests. 1. Define angular module of name appmodule. 2. Define angular controller of name mycontroller with scope employee object. 3. The EmpName of Employee object is initialized. 4. The scope() function is used to convert the EmpName on lowercase. Step 3: In this project we will add the Jasmine NuGet package. 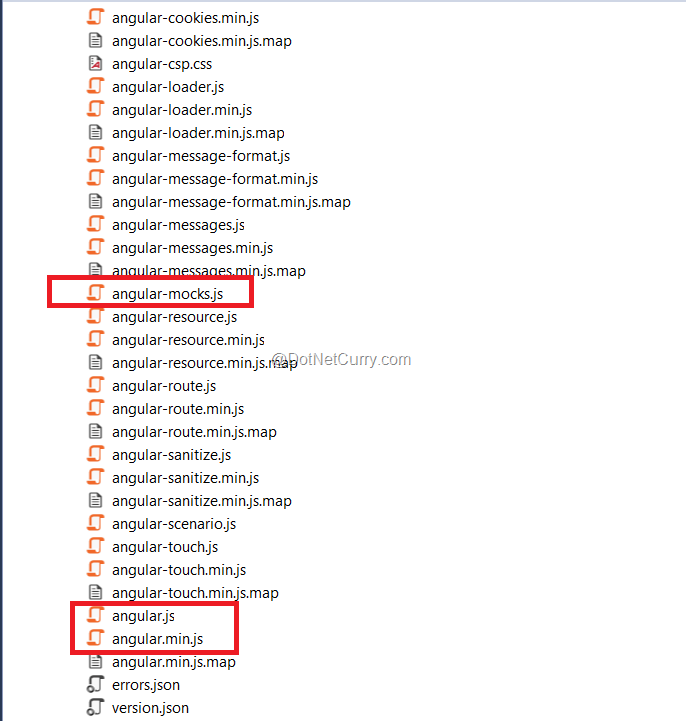 Follow same instructions as of Step 1 for AngularJS package. Jasmine sub-folder in the Content folder with jasmine stylesheets in it. Controllers folder with JasmineController.cs class in it. Jasmine sub-folder in the Scripts folder with Jasmine Framework Scripts. Jasmine-samples sub-folder in the Scripts folder providing some sample test scripts. Views folder with Jasmine sub-folder in it. This contains the SpecRunner.cshtml in it which is a View file containing sample scripts references. We will change this file shortly. 1. ‘describe’ defines what is it testing. In our case, it is a controller name passed to it. 2. ‘beforeEach’ allows to execute some code before each test spec. In our case, it is executing the angular module. 3. The spec is defined by calling the function ‘it’. The first parameter for this function is string which is title of spec. The second parameter is the spec itself. 4. The second parameter of ‘it’ contains one or more expectations for our test. In our case, it injects controller and scope and receives an instance of scope using $new for the controller $controller. 5. The ‘expect’ in scopeTestSpec defines the test for EmpName. 6. The ‘expect’ in scopeTestSpecFunction defines the test for lower() function. Step 6: Open Node.js command prompt and navigate to the project folder. This will install necessary karma plug in for the current project. This step will ask you for the Testing environment settings. These steps will generate karma.conf.js. This will specify files to be loaded during test. Step 8: Add following script references in the SpecRunner.html. The above image shows both test are successful. Press Ctrl+C to terminate the Test. It shows the first test 1 of 2 is successful and 2 of 2 failed with the required description. 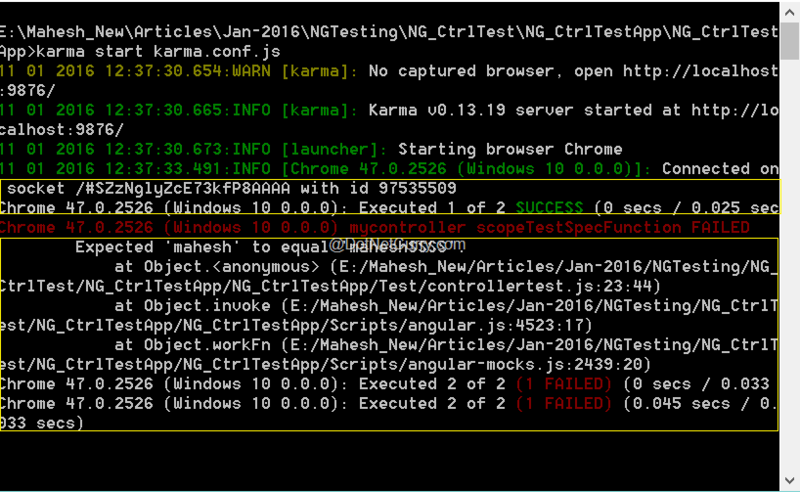 Jasmine with Karma provides a command line utility to unit test the Angular Controller without requiring DOM.